As soon as I walked in, it felt like home. From the sweet, fresh baked smell to the seemingly uncountable “helawiat” (sweets) displayed and glistening under glass like jewels. A kind faced man emerged from the kitchen greeting us with “as-salamu alaikum” (peace be upon you) in a perfect Damascus Arabic accent: drawn-out and sing-song. He looked and sounded like he could easily be one of my relatives and, at that moment, I knew for sure I was home. His name is Maher and he and his brother Humam were responsible for the experience we were about to have at Le Mirage Bakery in Anaheim, CA. Full disclosure, I use the term “home” here somewhat metaphorically. After all, I was born in Paterson, NJ and didn’t actually set foot in Damascus until I was 30 years old. But when I finally did, it was as if my blood and bones knew what to do – they felt at rest in a way I hadn’t ever experienced before in my life and there is no single place that has ever brought me more joy. So when I use that word home, it is much deeper than where I was born or the place I live – it is that ultimate thing we all seek, the true belonging we crave and strive for in every action of every day. I haven’t been to Damascus since 2006. And since the war began, I have been coming to terms with the fact that I might never see it or feel that feeling again in my lifetime. But here I was on the other side of the world in Anaheim, California feeling a bit of it right then and there. Now, a Syrian bakery in the U.S. is not in itself special; there are quite a few of them spread out in the multiple Arab enclaves that began forming here at the end of World War I. Back when the whole “Middle East” was known as Suria Al Kubra (Greater Syria), which also included Lebanon, Jordan, Palestine and parts of Iraq and Egypt. The place it was before Western colonialism and partition left the wake of destruction and the harsh reality we currently see in the region. Le Mirage is only one of at least a half dozen Middle Eastern bakeries in Anaheim alone, for example. But Maher and his brother did something unique there that I had read about in a New Yorker article just days before heading out on this trip, which drew me to his shop. Some might say it was crazy. And maybe it was a little, but it was the kind of crazy and irrational behavior that can only come from an infinite love. A little background is required to fully understand. In the Old City of Damascus, nestled in the main Souq (Market), there is a 130+ year old ice cream shop called Bakdash. It is famous throughout the entire Arab/Muslim world and beyond. But for Syrians, whether born there are not, there is no equal to the Arabic ice cream (Bouza Arabia) from Bakdash. I still remember the pride on my uncle Radwan’s face as he watched me take my first bite of it. It was like nothing I had ever tasted before or since and, for Syrians who might never see the Old City again, it is one of the experiences that stands out as you grieve in that reality. I don’t know Maher outside of our brief encounter, but I suspect that the love of, and the longing for home – the deeper home I spoke of earlier, drove him to take on the insane project of procuring and shipping one of the traditional machines used to make this special frozen treat. After much time and expense and multiple setbacks, he is making bouza arabia in his bakery. I doubt he needed to take this on or is making a ton of extra money, in his already successful bakery. I think however, that deep down he knew all the trouble and expense would be worth it somehow. I could see it meant so much to him, when I told him it was the reason I came there and had dragged six unsuspecting friends along with me for the experience of his ice cream at 10:30 in the morning. He relished it, helping me along with generosity and care as I ordered in broken Arabic, even though it would have been easier for us both to handle the transaction in English. He had the same look on his face that my uncle did that day as I took my first bite. As the sweet taste ran over my tongue, it was as though he could see and share in my joyful memories as they washed over my mind and, that every time he got to see that in someone, all of the trouble was justified in his mind. He could say to himself, “See, this is why!”. After leaving Le Mirage, we drove the seven plus hours back to San francisco and I was nothing short of overwhelmed by emotion. How did the simple act of eating ice cream do this to me? I was almost at the brink of tears and wasn’t even sure why. Nothing about that half hour or so we spent with Maher was actually about ice cream, his delicious kanafa or anything else he was selling. No, it was about belonging. It was about what we, as Syrians have lost. Whether we are living through the hell of war, are one of the millions of refugees who have been displaced or are (like me) one of the lucky ones who lives in safety, but are cut off (possibly forever) from the places and the people we so deeply love. Arab hospitality knows no bounds. For example, consider the way you welcome someone in Arabic, “ahlan wa sahlan”, which loosely translated, means, “May you arrive as part of the family, and tread an easy path (as you enter).” Of all the places I have been, no one has shown me more hospitality than the people of Syria. Maher, and the simple space he has created in a little strip mall in Southern California, is the archetype of the generosity, beauty, culture, and most of all, the hospitality that is Syria. He may have been in the business of selling sweets before the war, but now he is doing so much more. Now, he is showing every person that walks through his door the best of what Syrians are made of – that we are human beings worthy of dignity, respect and safety. That our history, culture and yes, even our ice cream, is part of the world’s history and culture – that it is important and most definitely worthy of saving and cherishing. “Ahlan wa sahlan, come sit and share some ice cream and laughter and be at home with us”. Currently, there are more than 5 million Syrian refugees who have fled the war and approximately 6.5 million internally displaced people within Syria’s borders. It is estimated that nearly 13.5 million Syrians are in need of aid. If you want to help, please donate to the International Rescue Committee (IRC). It was one of the big highlights of my trip Dean! Thank you so much for sharing even more of your memories here. It was a huge reminder of how we are all one people, no matter what those in power tell us. Just a beautifully written expression of why culture – music, fashion, media can bring us together in a way political or military interventions never can. 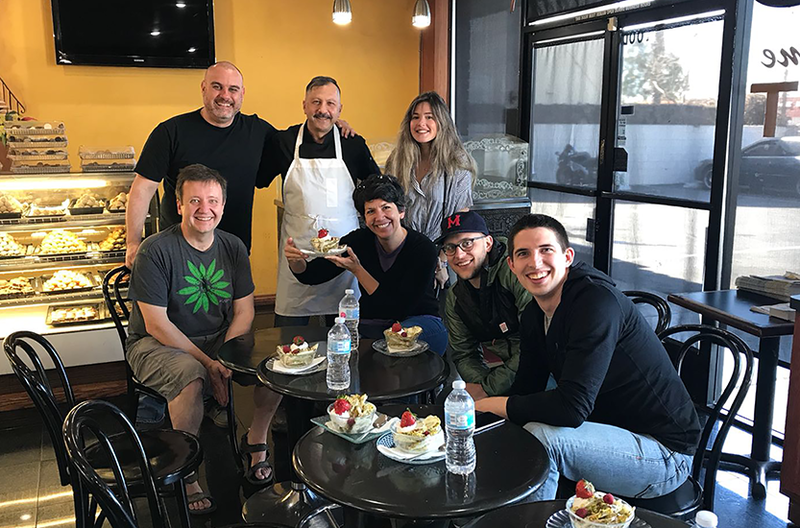 We come together in particular around a table of food, and what Maher, and many thousands of ethnic café owners, bakeries, food trucks and restaurant operators have obviously realize is that ordinary people experiencing food made with love is what ultimately will save the world. I hope you continue to tread an easy path Dean and thank you, as always, for so honestly sharing. Thank you for sharing this Dean. I was truly moved by your words and your feelings.